This is a Funny Bedtime Story for kids to read. 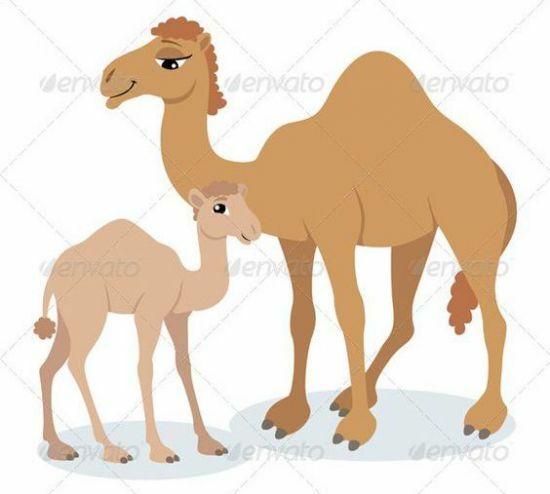 Once upon a time, a baby camel and his mother were resting under a tree. Now the baby camel was a curious being, as most children are. And there were certain parts of his body that the baby camel did not like. Also, read A Miser And The Villagers. Image Source@ in.pinterest.com. Suddenly the baby camel asks another question. “Then, mother why do we have long legs and round feet? They don’t look so pretty!” Again the mother camel gave a wonderful explanation. “These long legs and round feet have a reason, son. Here in the desert, it is difficult to walk. But with our feet, we have better control and our feet don’t sink in the sand.” “These feet let us walk in the desert better than anyone else!” The baby camel heard what his mother had said and understood everything. But his curiosity hadn’t died yet. “Alright”, he said, preparing to ask another question. “So, mother tell me one more thing. Why are our eyelashes so long? Sometimes they get in my way. It bothers me.” “Son, these eyelashes are extremely important. The thick eyelashes act as a protective barrier for our eyes. These keep the sand out of your eyes when strong winds blow. If the sand gets inside your eyes, it will be hard for you to see where you are going and you may hurt yourself,” the mother explained. “I see what you mean mother,” said the child, still curious. “If the hump stores water, the legs, and round feet help us walk easily on the sand and the eyelashes keep the sand out. Then, what are we doing here in a Zoo?” Also, read April Fools Day Story. MORAL: The skills and abilities that we possess are useful only when put in the right place. Otherwise, they go to waste.